With Fall upon here is here in Wilmington, it’s time to start switching up our approach to fishing. This is mainly due to changes in water temps, but also the food sources changes up a bit in the natural setting. In this, we also change up what we present, as well as the presentation itself. Thankfully we have a year around population of our most popular species – Redfish. With Fall comes a slowing of white bat (baitfish) that come through here thick during the summer months. However, the local fish do not move with them, they just change their diet up a bit to what is available. Deep in the grass pockets and along oyster beds are small crabs. This is a favorite of Redfish, but they are also in a near tie with shrimp for top snack. Also, fish tend to move and react slower in cooler waters. They are just as hungry and prepared to eat, they are just a bit slower going about it. But f you think about this, isn’t crab and shrimp a slower target than speeding pods of baitfish? Indeed. Given these two facts, there is your Fall Redfish game in a nutshell. Work small crabs and shrimp, either live or artificially, slowly across the bottom. This will almost always entice a Fall Redfish strike. Where you find these Redfish is similar to most other times of year. In deep pockets inside of grass beds, and along most structure that would attract, you guessed it, small crabs. BUT – that’s not the end of it. Redfish can still be found in packed schools in skinny water areas. So sight fishing for Redfish doesn’t slow even if the temps drop. You ca also excite summer type strikes by utilizing the right kind of day. When you ave a moderate morning, you can expect a warmer afternoon. Time this warmer part of the day with a moving tide, and you will find that Redfish will strike many summertime baits – including baitfish patterns as well as topwater lures. 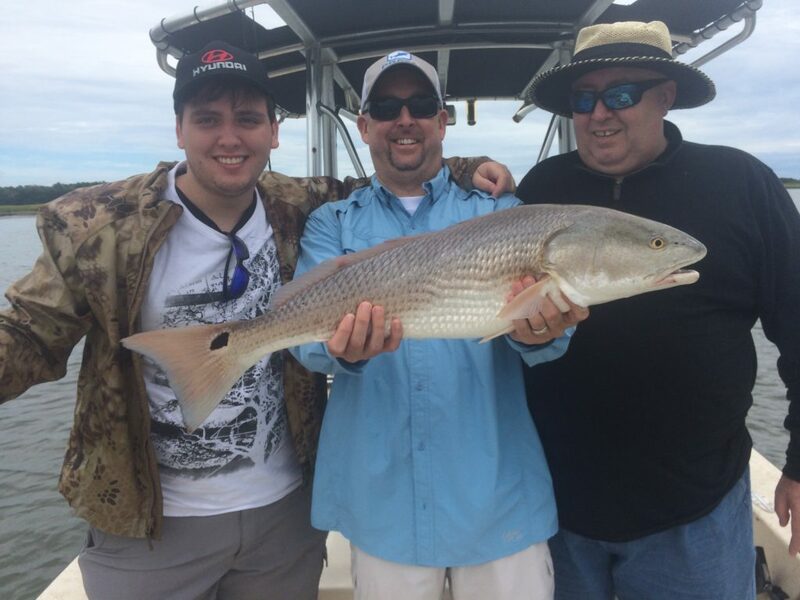 Planning a trip for big Wilmington, North Carolina Redfish? Give us a shout to get those plans roling.